As the history of a city is written there are certain individuals who are usually recognized as being responsible for major changes in that city. One of those men was Tom Godsell — often called the “Founding Father of Franklin”. Serving as Town Chairman from 1949 to 1956, he was part of a group of citizens that were instrumental in keeping the Town of Franklin from being annexed piecemeal by Milwaukee and surrounding communities. On June 11, 1956 a petition was filed by Milwaukee for an incorporation referendum. Because of this town officials had to go into hiding to avoid being served the papers and to try to block incorporation. Unknown for many years, Godsell hid in his farm silo for several weeks to avoid being served that summons. 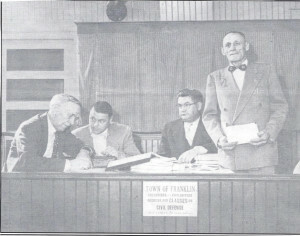 After Franklin became incorporated as a city in its own right, Godsell served as the interim mayor until the first mayoral election was held. Although he had lost in his bid for mayor, Godsell continued to be involved in city issues. Godsell was born in Clyman, Wisconsin but moved to Franklin at 23 years of age when his parents bought the Sheehan farm in 1911. It was the Sheehans, Michael and brother Patrick, who were some of the original settlers in St. Martins, arriving in Franklin in 1830’s. It was the Godsell men who walked their own cows from Clyman, Wisconsin to Franklin to take over the Sheehan farm. In 1920 Tom Godsell became the new owner of the farm that his parents had previously purchased from the Sheehans. He married in 1921, raised a family of 7 children and worked the land until it was sold in 1967. The farm was then subdivided as part of the Mission Hills subdivision and the farmhouse was torn down. The kitchen of that farmhouse was saved since it is believed to be the original log cabin built by the Sheehans. Because of its historical significance, it was moved in 1975 to the Franklin Historical Park east of Franklin City Hall. The cabin has now been restored and furnished as it would have been when used in the 1800’s. An Irishman, Tom Godsell was said to have twinkling blue eyes, a mischievous smile, a quick wit and a very alert mind. Because of his many interests, Godsell was a 4-H leader, organized 2 baseball leagues and was a longtime member of Holy Assumption Church in St. Martins (now merged with Sacred Hearts to form St, Martin of Tours Parish). Although Godsell had no more than a 6th grade education, he served on many boards and belonged to many organizations — at the federal, state and local levels. These included: The WWII Rationing Board, the Selective Service Board, the Federal Land Bank, the Milwaukee Breeders Association, the Milwaukee County Agriculture Commission, the Franklin Planning Committee, the Franklin 4th of July Commission and the Franklin Taxpayers League. There were many “firsts” that Godsell also was involved in. With his guidance, Franklin was the first community in Milwaukee County to institute the use of voting machines. He helped form the Franklin Civic Association, was a charter member of the Franklin Historical Society and founded the Franklin Senior Citizens group. Although not a veteran, Godsell was instrumental in the formation of the Willey-Herda American Legion Post 192 that was founded in 1940. He founded and served on the board of the Midland Co-op and was also credited with helping bring the produce and stock fair from Hales Corners to St. Martins. Had it not been for that decision, the St. Martins Labor Day Fair would not have been held in Franklin all of these past years. Godsell’s proudest achievement, however, was the formation of the Franklin Fire Dept. 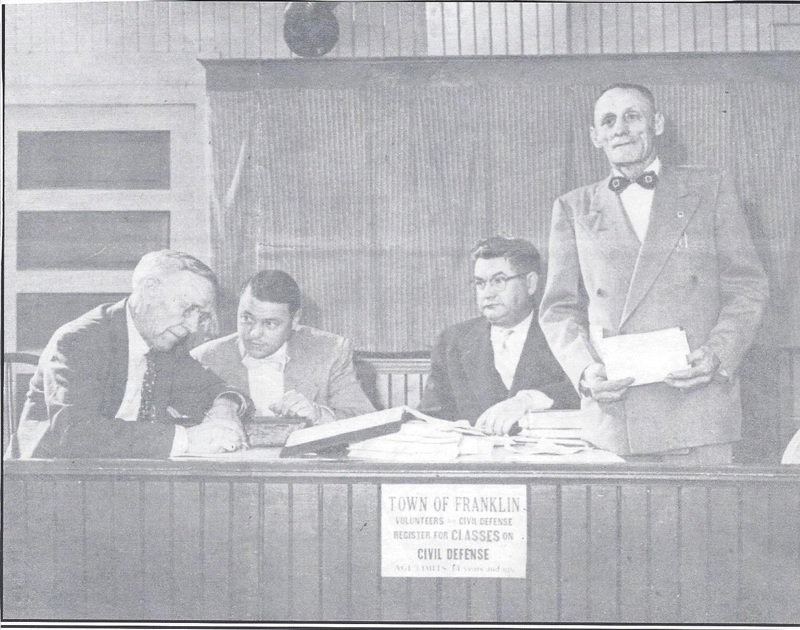 In 1955 Town Chairman Godsell and Town Board member Dave Mayer bought a 1934 Ford truck from Union Grove for $250 — using their own money! He and Mayer had decided that Franklin no longer needed to pay Hales Corners for each fire they extinguished (at a cost of $250 each) and that Franklin needed to have its own fire engine! The first day that the fire engine was on the job the truck answered 3 calls, more than proving its value to the community. The Franklin township then repaid Godsell and Mayer. It was that fire truck that led Godsell’s funeral procession in 1977 and it has been a part of many of Franklin’s 4th of July parades ever since. In the years before his death, Godsell received many accolades and awards including recognitions signed by Presidents Eisenhower, Kennedy and Johnson. In 1962 he was named “Man of the Year” by the Franklin Civic Association and in 1970 he received the Franklin Jaycees’ Distinguished Service Award for his long and distinguished career in public service. The name Godsell is still very much a part of Franklin — whether it is a street name, a name on a plaque or a name on a historical building. All of these things are testimony to a man that worked tirelessly to make a contribution to the development of Franklin.